A powerful new tool from the Android developer community has been released today. It’s called CyanogenMod Compiler and it lets you cook your own special flavor of CyanogenMod 7 (based on Android 2.3.x) or CyanogenMod 9 (based on Android 4.x). We’ve got the details and the relevant download link available after the jump! News of the tool comes straight from XDA-Developers – a popular forum for Android enthusiasts, developers and modders – in the form of a thread posted by developer and member of CyanogenMod Team lithid-cm in which he introduces CyanogenMod Compiler to the community, discusses its current and future features. As the name suggests, CyanogenMod Compiler compiles CyanogenMod ROMs for your device. When you download and launch it, it presents a menu in a command-line interface which gives you options like choosing your device manufacturer and model, remove live as well as pre-included wallpapers and change theme so that you can cook a customized version of CyanogenMod. CyanogenMod Compiler is currently in alpha state and there are plenty of known issues that are being worked on currently. The developer has asked the community to test the tool so he can find more bugs and then, of course, fix said bugs. This is simple enough. Using bash, I created a cli interface to control and manage your repo, add/remove a few things, and compile cm. I am only able to test this with my phone. So I am putting this out here for others to test with as well. It is not fully optimized, code is being actively worked on daily. 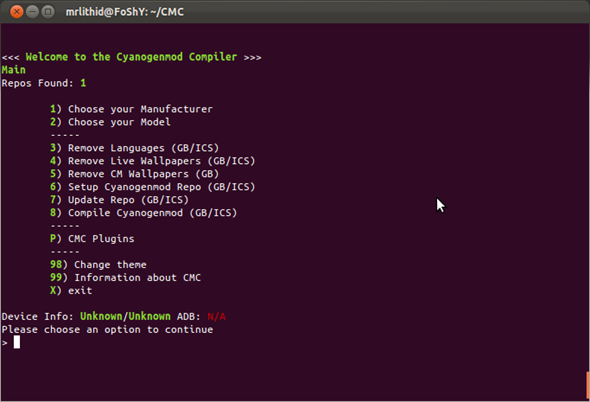 As of right now, CyanogenMod Compiler only works on popular Linux distribution Ubuntu. It doesn’t offer too many compelling features at the moment, but future features like the ability to compile a ROM based purely on AOSP should make it a pretty popular tool. CyanogenMod Compiler is, of course, a free download and can be installed with a simple command in Terminal. Instructions for cooking your own version of CyanogenMod are available from the link embedded below. For queries, check out the official thread over on XDA-Developers by clicking on XDA above.